Humminbird’s most recent fish finder family, the Helix, has changed the face of sonar fish-finding units. The Helix Fish Finder family is comprised of several different models to accommodate every need and budget. Today, we will be reviewing one of the higher end models of the Helix family, the Humminbird Helix 10 SI. 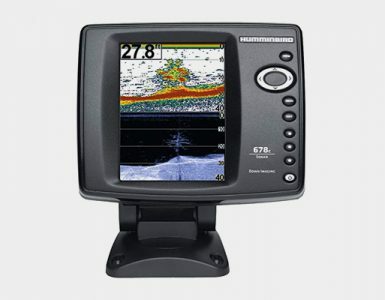 The Humminbird Helix 10 SI has a brilliant 10.1-inch display (measured diagonally) with a stunning 1024H x 600V pixel matrix resolution. You can almost infinitely customize your display by choosing from a 65,000 color grayscale. The HD LED-backlit display makes viewing easy, even in harsh sunlight. 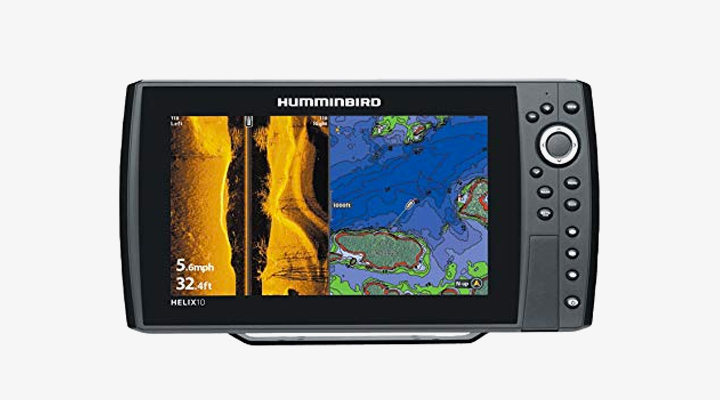 The Humminbird Helix 10 Fish Finder operates on standard, Side Imaging, Down Imaging, and DualBeam PLUS sonar, with the output of 200/83/455/800/50 kHz. This unit packs a real wallop with a max power output of 8000 watts PTP (peak to peak). The unit has a depth range of 150 feet with the Side and Down Imaging, and a standard sonar depth range of 1500 feet in salt water, 3000 in fresh. An optional 50 kHz transducer gives you extreme deep water capability. 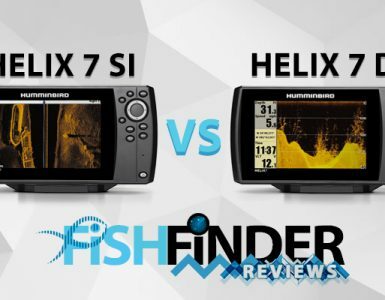 In our previous review of the Helix Fish Finder family, the Humminbird Helix 5 SI, we covered the standard features of the Helix Fish Finder family; in this review, we will quickly restate those and then give you the skinny on what sets the bar higher with the Humminbird Helix 10. Humminbird Side Imaging Sonar equips you with a 1800 side-to-side perspective sweep. An ultra-thin sonar beam sweeps 240 feet to each side of your vessel, in essence giving you a 480 foot sonar sweep. You can zoom in, change color scale of your view, and more. 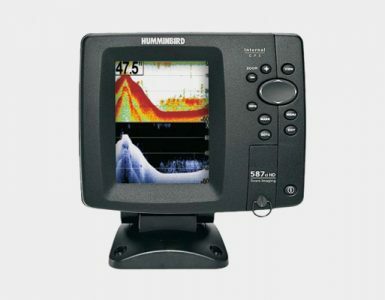 Humminbird Down Imaging Sonar gives you a brilliantly clear submarine view. An ultra-thin sonar beam is cast down and returns an exact picture of what’s beneath your vessel in stunning detail. The potential here could go way beyond fishing. Humminbird Switchfire Sonar enables you to choose what is displayed on your screen: use Clear mode to see just targets, filtering out undesirable interference, such as bait pools, water current, and more; or use Max mode to see everything. This enables you to keep a watchful eye on your jig and approaching targets of all size. Humminbird Helix units come with single beam sonar and DualBeam PLUS. Use the single beam to see a 20o beam at 200 kHz, which presents you with a precision image beneath you. Combine this with the DualBeam PLUS to also get a wider scan of the area with 83 kHz. With the single beam, coverage equals ⅓ of the depth and with the DualBeam PLUS coverage equals the depth. QuadraBeam PLUS sonar shoots out a 35o beam scanning to the right and left of your single and DualBeam of what’s below you. Check the model you are considering to see which types are available. Hummingbird Precision GPS pushes the edge of the envelope: giving you an accurate position fix within 2.5 meters, allowing you to mark as many waypoints as you can fit on the SD card (another feature of the Helix Fish Finder family, onboard SD card storage), you won’t get lost or lose your new favorite hotspot. And Waypoint Management lets you sort and mark each waypoint with a great variety of tags or icons, so you find what you want fast. One of the biggest features of the Helix Fish Finder family is the split screen viewing, which allows you to view several different sonar modes at once in sections on the display screen simultaneously. Taking it up a notch, the Humminbird Helix 10 SI also includes some other jaw dropping features. The Humminbird Helix 10 comes with two, instead of the standard one, SD card slots, so you can store an increased amount readings, screenshots, waypoints, and much more than with other models. Humminbird ContouredXD is an advanced form of the Humminbird Cartography technology. ContouredXD allows you to view a database of US lakes in full contour display. This is a powerful feature, putting a database of contoured lake maps at your fingertips. Humminbird HD Radar gives you the heads up on nasty conditions headed your way, as well as objects such as other vessels on the water, floating hazards, and much more. This gives your situational awareness on the water a tremendous boost, which can be very important in low visibility conditions or for avoiding partially submerged obstacles. And Humminbird Fish Finder AIS technology sends you updates on the exact location of other AIS-equipped vessels, so you can navigate high traffic areas safely. Humminbird NMEA technology reading capability is loaded into the Helix 10 SI Fish Finder, so you can use the unit to view information from NMEA sensors you have installed in the boat: get a glance at anything from your fuel level to weather updates and more. The Humminbird Helix 10 has many networking options, including wireless and ethernet. If you’re looking for a step up from smaller sonar units to more powerful and comprehensive features, the Humminbird Helix 10 SI Fish Finder might be your ticket. With the above and more features integrated, it is an incredible unit for your money.